Telomere length (TL) is a biomarker of age, longevity and age-related disease. If you are an avid follower of our blog, The Genetic Link, you’ll notice that we’ve posted about TL previously (you can find the links here and here), because we find this area of research fascinating. 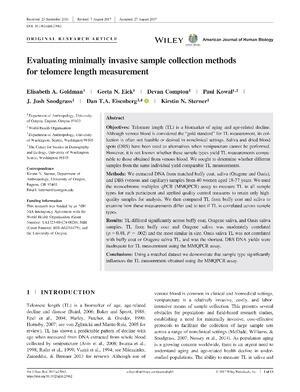 In a recent publication titled Evaluating minimally invasive sample collection methods for telomere length measurement, Elisabeth Goldman and colleagues at the University of Oregon compared TL measurements from different sample types*. Venous blood collected in a clinical setting is considered an ideal sample type for TL studies, but is also an invasive and labour-intensive procedure, which “presents several obstacles for population- and field-based research studies, establishing a need for minimally invasive, cost-effective protocols to facilitate the collection of large sample sets across a range of nonclinical settings.” * The researchers compared minimally invasive, easy to collect sample types that would not need cold-chain transportation or immediate processing, and that would facilitate collections from large cohorts. They also characterized the magnitude of the TL measures among all sample types. In this study, 4 sample types were collected using 5 different methods from 40 subjects of varying age. Venous blood was collected via syringe and divided into both buffy coat and dried venous blood spots (vDBS). Capillary blood was collected via a finger prick and stored on DBS cards (fDBS). Saliva was collected using two separate methods: saliva with Oragene/DNA self-collection kits and buccal cell abrasion/mouthwash technique. DNA from all samples were extracted, quantified and quality assessed, and TL measured using the monochrome multiplex qPCR (MMQPCR) assay. Buffy coat was considered the baseline to which vDBS, fDBS, Oragene and buccal cell/mouthwash samples were compared. The results were very interesting. After DNA quality control measures were applied and subpar samples removed from further analysis, out of the original 40 samples the following remained: 35 buffy coat, 39 Oragene, 37 buccal cell/mouthwash, and only 4 vDBS / 6 fDBS DNA (representing roughly a 90% failure rate). The greatest DNA yield was from Oragene saliva samples at 57.7 ng/µl (mean SE 2.21%), followed by buffy coat at 31.0 ng/µl (mean SE 3.03%) and buccal cell/mouthwash with 12.5 ng/µl (mean SE 2.01%). The vDBS and fDBS had the lowest DNA yields at 1.39 ng/µl (mean SE 46.8%) and 1.84 ng/µl (mean SE 22.3%) respectively. Due to the very low number of usable DBS samples, TL comparison with chronological age as a measure of external validity was only evaluated in buffy coat, Oragene and buccal cell /mouthwash samples. Both Oragene saliva and buffy coat samples did show the characteristic pattern of decreased TL with increased age necessary for TL studies. Buccal cell/mouthwash samples, however, showed no correlation. “… experimental design and methodology must be considered if TL is to be effectively incorporated as a biomarker of aging and disease in population- and field-based research... Saliva [Oragene] is an appealing option for field-based research because it is low-risk and easy to collect in nonclinical settings.”. We congratulate Dr. Goldman and her team at the University of Oregon on their successful publication and look forward to more discoveries on TL length, age, longevity and age-related diseases. If you would like to try the Oragene saliva self-collection kits used in this study, please contact us at info@dnagenotek.com or click on “Request free trial kits” button to the right of this page. *Goldman EA et al. Evaluating minimally invasive sample collection methods for telomere length measurement. Am J Hum Biol. 30(1):1-13 (2018).